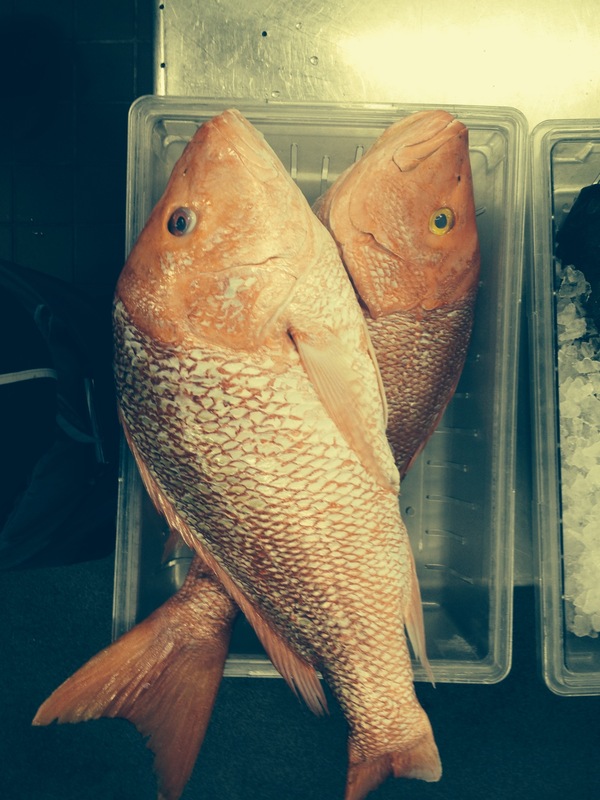 This great snapper recipe feeds 8. 8 thick cut bacon slices. Let butter soften but not melt. Grease a large baking pan or casserole dish. Spread half the butter on one side of the fish. Put snapper into pan butter side down. Drizzle half the lemon juice on top of the fish. Drizzle half the olive oil on top of the fish. While fish is baking, simmer the celery, onion, garlic, parsley, thyme, oregano, vegetable juice and wine in the medium pot. Remove the fish from the oven after 15 minutes. Add vegetables, remaining lemon juice, olive oil, vegetables and juice from the medium pot. Spread remaining butter over fish. Return to oven and bake for 25 minutes or until fish is flakes easily. Placing fish in the center of a shallow bowl surrounding it with the vegetables works well. You can also serve it over rice.